Versatile U.V. Irradiation Instrument utilizing three (3) channel design, allowing easy control of the UV light intensity as well as UV bulb exchange and UV bulb service life monitoring. This product is an important addition to our existing product line, which already includes UV Cuvettes. When the lid is closed, the pin located at the bottom side of the lid activates the built-in safety micro-switch, which turns “ON” pre-selected UV bulbs. The UV instrument is designed to accept up to three (3) UV bulbs. The selection of the UV bulbs installed and their configuration must match the requirements of the application targeted. In general, UV-C is best for destruction of bacteria and viruses and UV-A is often used in combination with UV-C for special applications. 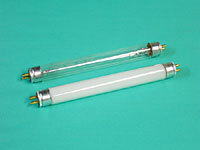 UV-B bulbs are available upon special request. 4 Watt: "A" or "C"
8 Watt: "A-A" or "A-C" or "C-C"
12 Watt: "A-A-A" or "A-A-C" or "A-C-C" or "C-C-C"
To change the UV bulb grasp the bulb at each metallic end (with the machine turned “OFF”) and slightly twist the bulb to remove it from the slot. The installation of the UV bulb is done by sliding the UV bulb pins (located at each end) into the UV bulb socket, and gently rotating the bulb 90° (axially). A special care should be taken not to touch the glass part of the bulbs with your fingers as this can deposit oils on the glass and shorten the life of the UV bulb. Important Note: Due to a frequent switching “ON/OFF” of the UV bulbs, the service life of UV bulbs is greatly diminished. This is caused by a surge of an electrical current that wears out the elements in the UV bulb(s). For the above outlined reasons it is recommended to change the UV bulbs in regular intervals, which would not exceed 300 hours. UV bulbs can be marked (on the metallic end caps) using the permanent marker. Such UV bulb identification along with the written log will help prevent confusion when using bulbs with various UV wavelengths, and will help to keep a track of the total amount of service hours logged by different UV bulbs. Weight: 1.0kg / 2.2Lbs. | Unit + Power Adapter - 1.5kg / 3.2 Lbs. OzoneLab™ Mobility offers clients options for mobile situations. A full selection of optional ozone accessories is available to clients through our Ozone & UV Accessory Area.